In the light of the stars, a little tomb lay in drowned R'lyeh. On Sunday morning, the stars came almost right, and - boom! - out of the crypt came a big and very hungry cthulhupillar. An artist and lifelong fan of Lovecraftian literature, Ben Mund retells the story of Cthulhu in a humorous and horrific spin of classic children's literature. Read and discover just what the very hungry cthulhupillar devours in its quest to sate its ravenous appetite! 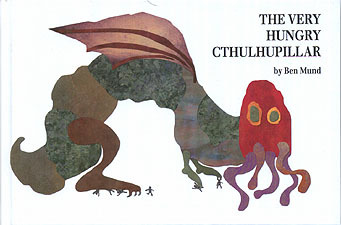 The Very Hungry Cthulhupillar features full-colour illustrations of Ben Mund and a bonus short story adapted by Jamie Chambers, and will call back fond memories of childhood along with the maddening knowledge of our cosmic insignificance and forthcoming doom. This book is not intended for young children.